Posted on August 9, 2018 August 9, 2018 Bizarre.Los.AngelesPosted in Haunted L.A. 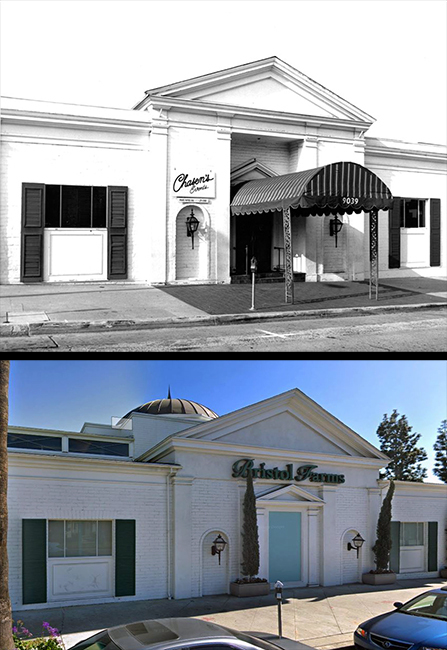 Allegedly haunted: Bristol Farms (formerly Chasen’s) – 9039 Beverly Boulevard, West Hollywood. 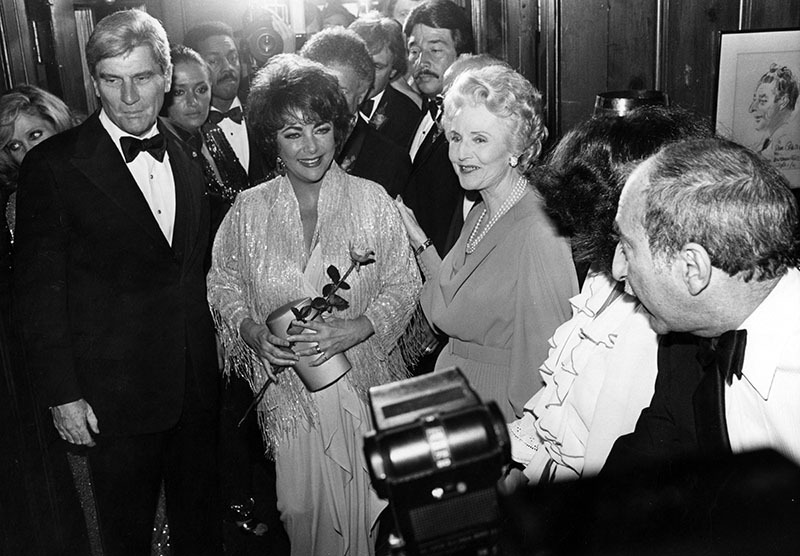 Like errant tankers and small planes drawn inexorably into the Bermuda Triangle, the famous, the lovely and the powerful still feel the centrifugal pull at the intersection of Beverly and Doheny, home of the original Chasen’s restaurant. L.A.’s ultimate celebrity watering hole is today a Bristol Farms market in West Hollywood, but the old glamour lives on in the Bristol Cafe, a small eatery between the deli and the sushi bar where customers can slide into an original Chasen’s booth and order the famous Chasen’s chili, a household word since 1962, when Elizabeth Taylor had 10 quarts shipped to Rome during the filming of “Cleopatra.” “Ronald Reagan proposed to Nancy where we now have the cheese area,” says store director Louis Fajardo. The barbecue stand opened by vaudeville entertainer Dave Chasen in 1936 became a hangout for W.C. Fields, John Barrymore, Clark Gable and James Cagney. 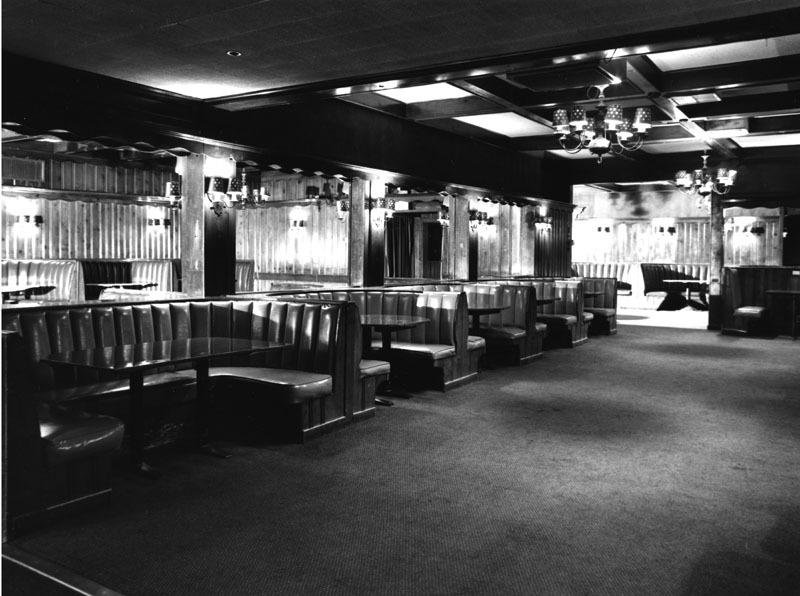 An expanded Chasen’s later became the place to party after the Academy Awards; regulars over the years have included Jimmy Stewart, Grace Kelly, Greta Garbo, Frank Sinatra, Humphrey Bogart, Lucille Ball and Howard Hughes. Chasen’s wife Maude once boasted that she hosted “every president since 1936 except Roosevelt. 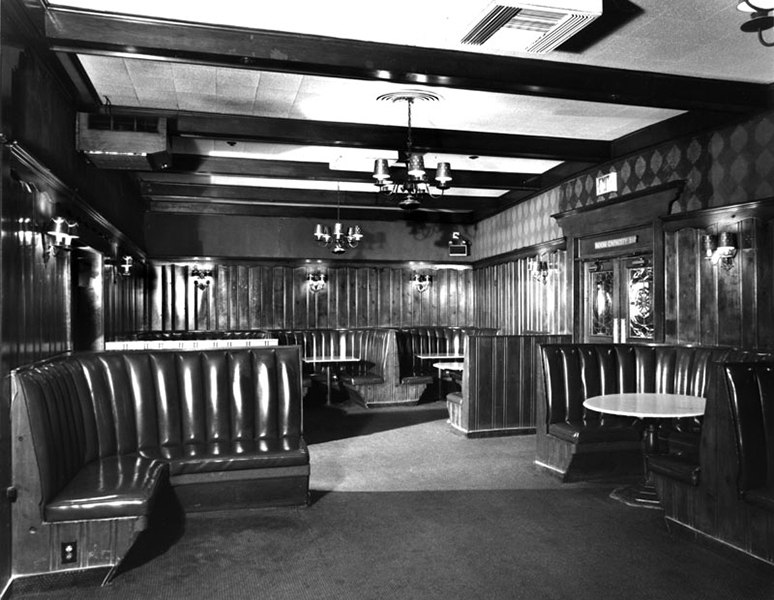 And Mrs.Roosevelt came.” After her husband’s death in 1973, Maude Chasen carried on until the original Chasen’s closed its doors on April 1, 1995. 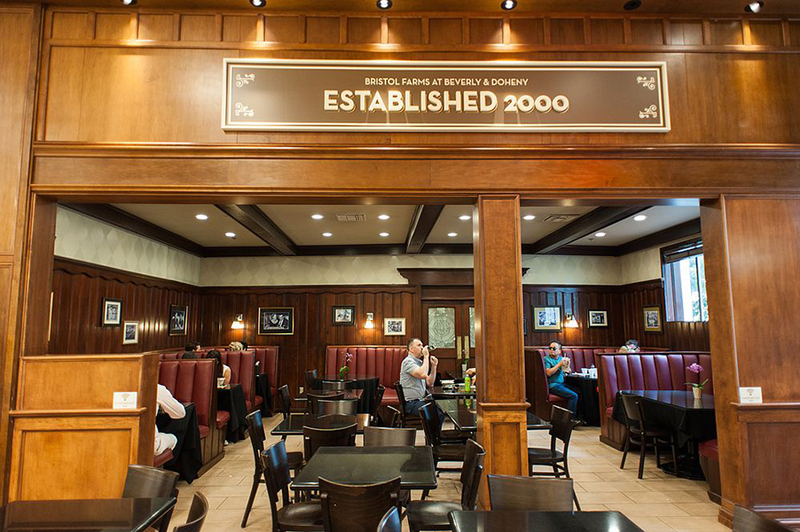 Most of the silverware, fixtures, barstools and sinks were auctioned in October 1999; Bristol Farms opened in November 2000. 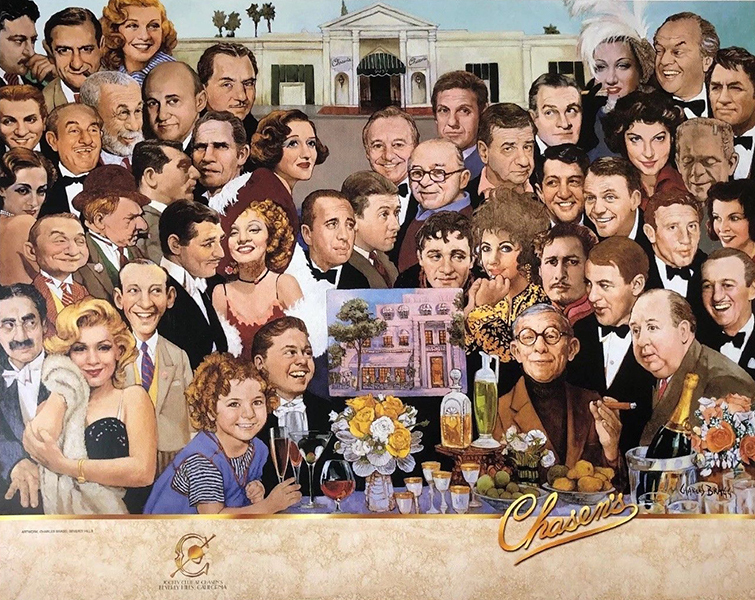 Artist Charles Bragg created a promotional poster featuring Chasen’s famous clientele. 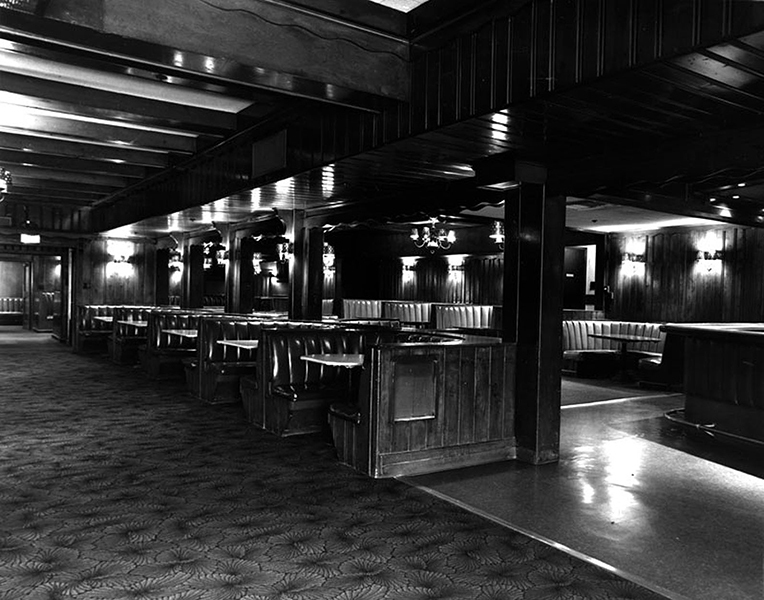 But the restaurant’s proud heritage as a discreet but convivial celebrity oasis is still alive at Beverly and Doheny. Fajardo says the store draws a lot of famous traffic, but won’t name names beyond the cryptic hint that “if you were a young man and had a pop idol, you’d see her coming in here.” Bristol Farms also maintains the Chasen’s ban on media lenses. “We chase away paparazzi when celebrities are shopping,” Fajardo says. The store sells newspapers and magazines, but tabloids are strictly taboo. “It’s company policy,” Fajardo says. “We want them to feel comfortable. Some come in with sunglasses and their hats pulled down.” On the other hand, Bristol Farms has an agreement with MTV for shooting “The Osbournes” during family shopping forays, and the market has been a location for scenes from the HBO program “Six Feet Under.” Nancy Reagan, who entertained former British Prime Minister Margaret Thatcher at Chasen’s as recently as 1995, has been spotted having lunch at Bristol Cafe. All that’s left of Chasen’s interior today. Photo: Eater Los Angeles, c. 2015. * Chasen’s used the best beef chuck, center cut, trimmed completely of fat. The restaurant used a special meat grinder, but for the home cook, meat chopped into one-quarter to one-half-inch chunks is much better than ground meat for this chili. ** Sometimes cumin seed is used in place of the ground cumin. It’s a matter of personal preference. Rinse the beans, picking out debris. Place beans in a Dutch oven with water to cover. Boil for two minutes. Remove from heat. Cover and let stand one hour. Drain off liquid. Rinse beans again. Add enough fresh water to cover beans. Bring mixture to a boil. Reduce heat and simmer covered, for one hour or until tender. Stir in tomatoes and their juice. Simmer five minutes. In a large skillet, sauté bell pepper in oil for five minutes. Add onion and cook until tender, stirring frequently. Stir in the garlic and parsley. Add mixture to bean mixture. Using the same skillet, melt the butter and sauté beef and pork chuck until browned. Drain. Add to bean mixture along with the chili powder, salt, pepper and cumin. Bring mixture to a boil. Reduce heat. Simmer, covered, for one hour. Uncover and cook 30 minutes more or to desired consistency. Chili shouldn’t be too thick – it should be somewhat liquid but not runny like soup. Skim of excess fat and serve. NOTE: You can freeze this chili for several months. When reheating refrigerated leftover or frozen chili, add a few tablespoons of water to regain proper consistency. Season steak to taste with pepper. Wrap fat around steak to cover sides completely but not top or bottom of steak. Tie around sides with 1 string near top or bottom or steak. Tie another string over steak to hold fat securely. Combine salt and water to make mush. Mound mush over top of steak, covering meat completely. Place steak under broiler and broil 8 to 10 minutes, depending on size. Remove salt crust, keeping crust in 1 piece. Turn steak over and place salt on other side. Broil another 8 to 10 minutes. Remove steak from oven and discard salt and fat. Slice meat, cutting slightly on diagonal. Heat butter in chafing dish or large skillet until foaming and lightly browned. Place meat, few slices at time, in foaming butter. Cook to desired degree of doneness. Allow about 1 minute on each side for rare. Place each slice of meat on 1 slice of toast and spoon some of hot butter over. Makes 2 servings. 415 calories; 863 mg sodium; 111 mg cholesterol; 23 grams fat; 19 grams carbohydrates; 30 grams protein; 0.07 gram fiber. Pre-heat oven to 350. Butter and flour 12 individual charlotte or cake pans. With an electric mixer on high speed, cream butter with the sugar until pale and fluffy, about 5 minutes, frequently scraping down the sides of the bowl. Add eggs one at a time, beating well after each. Add vanilla. Coninue beating on high speed for 6 minutes, frequently scraping down the sides of the bowl. Set aside. Resift flour with salt and baking powder. With mixer at lowest speed, add flour mixture slowly to batter. When incorporated, add cream. Beat only until blended. Place cake pans on a baking sheet and divide the batter equally among them. Bake on center rack about 25 to 30 minutes, until a toothpick inserted in the middle of each cake comes out clean and the cakes are just beginning to shrink from the sides. Cool 5 minutes on a wire rack; invert each cake onto your hand, then place right side up on the rack to finish cooling. Whip cream with sugar until stiff. Fold in sugar and vanilla extract. Whip cream with sugar and vanilla extract until stuff. Fold ice cream into whipped cream. Toss the banana with the rum and fold into whipped cream mixture. 4 small, ripe bananas, sliced, plus 1 banana sliced, sliced into thin rounds. Source: Gail Monaghan, “Lost Desserts,” House and Garden Magazine, October 2001.